The league leaders lost out to the bottom-placed hosts. 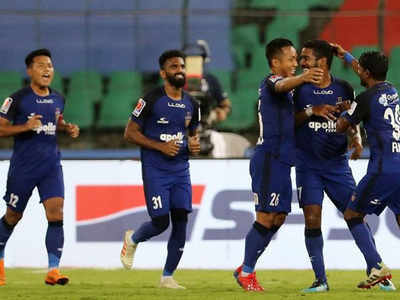 Chennai: Chennaiyin FC claimed a much-needed victory after downing table-toppers Bengaluru FC 2-1 in a closely-contested Indian Super League clash at the Jawaharlal Nehru stadium in Chennai on Saturday. After withstanding some early pressure from Bengaluru, Chennaiyin roared into a two-goal lead after fine strikes from Jeje Lalpekhlua and Gregory Nelson. Sunil Chhetri pulled one back for Bengaluru FC in the second half but the home team held on to inflict only the second loss of the season for the visitors. The result does not alter the teams’ position in the ISL table with Chennaiyin still rooted to the bottom while Bengaluru remain four points clear of second-placed Mumbai City FC. As expected, it were Bengaluru FC who saw most of the ball in the initial exchanges. The Blues forced Chennaiyin FC goalkeeper Karanjit Singh into a save as early as the third minute when Xisco Hernandez saw a dipping shot parried away. The home team looked a bit short of ideas in possession and were dealt a blow in the 15th minute when centre-back Zohmingiliana Ralte suffered an injury after a tackle by Miku. John Gregory was forced to bring in Anirudh Thapa and Christopher Herd dropped back into defence. The substitute almost had an instant impact when he stung Bengaluru custodian Gurpreet Singh Sandhu’s palms with a long-range effort. The home team continued to build on that and took the lead just past the half an hour mark. Raphael Augusto dispossessed Harmanjot Khabra before feeding CK Vineeth who broke forward. However, Nishu Kumar failed to deal with Vineeth’s attempted pass and the ball broke to Jeje who slammed the ball in to break his ISL duck for the season. Spurred by that goal, Chennaiyin started to show more confidence on the ball, with Augusto pulling the strings. The Bengaluru defence had a tough time dealing with the increased impetus from the home team and ended up conceding another goal just before half-time. Laldinliana sent in a dangerous cross from the right wing after some good work from Vineeth. Nelson, who had ghosted in behind a static Bengaluru defence, sent a good header past Gurpreet into the far corner. Just like they did in their previous game against Kerala Blasters FC, Bengaluru produced a response after going two goals behind in the second half. After a spell of incessant pressure, the Blues pulled a goal back three minutes before the hour mark. Xisco picked the ball up on the right wing and teased a left-footed cross in behind the defence for Chhetri. None of the Chennaiyin defenders picked up Chhetri’s run and he gleefully sent a diving header past Karanjit Singh from close range. Bengaluru tried to keep the pressure up in search of an equaliser but frequent stoppages in play meant they lost some rhythm and Chennaiyin found some respite. The match turned sloppy as the half wore on with frequent interceptions and turnovers. With eight minutes left, Xisco had the best chance of equalising when second-half substitute Edmund Lalrindika teed off the Spaniard. But his shot was straight at Karanjit. In the end, it was three points and a much-needed win to savour for Chennaiyin FC in a season that has brought very little joy.